Eye floaters are small, moving spots in a person’s field of vision. They appear in different shapes, such as dark spots, cobweb strands or squiggly lines. Eye floaters are often more noticeable when looking at a bright object or in direct sunlight. Eye floaters are usually caused by small flecks of collagen that cast shadows on the retina. They are often the result of age-related changes in the vitreous substance of the eyes. Eye floaters are generally harmless but require medical attention if they increase in frequency or occur with flashes of light or a loss of peripheral vision. Eye floaters are most likely to occur in people who have undergone cataract surgery or who are very nearsighted. Eye floaters generally do not go away once they form, but do become less noticeable over time. Most floaters are harmless. They are tiny bits of coagulated collagen that accrue in the liquid at the back of the eye, known as the vitreous humor. The number of floaters a person has increases with age. If an abnormal number of floaters appear in a short amount of time or are accompanied by eye pain, this could be symptomatic of severe eye injury requiring immediate medical attention. The main causes of eye floaters, or small moving shapes in a person’s field of vision, are small flecks of protein called collagen. Other less common causes include eye injury, diabetic retinopathy and eye disease. As a person ages, the collagen in the back of the eye can become shred-like. When this occurs, accumulation of shredded collagen sometimes causes the vitreous humor, or gel, to move away from the retina, resulting in floaters. Eye disorders and diseases occasionally associated with floaters include retinal detachment, retinal tear, vitreous hemorrhage, retina inflammation and eye tumors. Migraine headaches can cause a person to see floaters as well. What causes eye floaters after cataract surgery? Eye floaters after cataract may be due to a condition called posterior vitreous detachment (PVD). Eye floaters are quite common after this eye surgery because the procedure may cause eye trauma that results in PVD. Eye floaters are tiny specks, spots, cobweb-like forms and lines that appear in the field of vision as a person moves his eyes. PVD is a condition in which the jelly-like substance, which is found at the back of the eye, separates from the wall at the back of the eye. Eye floaters are the small bits of vitreous substance that becomes detach and seem to float in the field of vision. PVD is more prevalent in older people because this gel-like substance, which is called the vitreous humor, becomes more liquid with age and leads to its detachment. Eye floaters are more common in people between the ages of 50 and 75. Eye floaters and PVDs may be one complication associated with cataract surgery. However, the symptom of eye floaters will become less noticeable with time. It may take a few weeks or even months to see some improvement. If new floaters develop after the problem has been resolved, it may indicate a retinal tear. Similarly, although most PVD cases are not emergency situations, some can pull on the retina, leading to damage and a retinal tear. However, if you’re suffering from eye floaters and visit a doctor, they’ll probably recommend surgery. Despite the fact there are now natural solutions available. Why is this so? Bottom line… IT’S BECAUSE OF MONEY. There’s no profit for them if they promote natural methods. They’ll do whatever they can to hide the natural solution from the public. You see, a lot of these doctors are likely to get a commission if they recommend a patient to a surgeon. You’d be surprised what goes on behind the scenes. Let’s just say that Money Talks. So with that being said… what’s the natural solution I’ve mentioned above? It’s a revolutionary new program called “Eye Floaters No More.” And it’s based around a step-by-step action plan on how to get rid of your eye floaters in the comfort of your own home. Bottom line… you’ll get rid of your annoying eye floaters once and for all… or your money back. The program is 100% safe and it’s been proven to work. ← Hug Your Cat Today! I just read your article on eye floaters. I had some floaters begin to appear in my my right eye vision recently. I was recommended to, and just had laser surgery today to repair or secure some small tears to my retina. I’m optimistic that this will help my retina avoid future detachment problems. I was wondering if your “Eye Floaters – No More” program will still be effective; even after I’ve had the above procedure done??? I really appreciate your column and information on this subject matter. Very informative! How are you doing today? I would like to thank you for reading my article regarding Eye Floaters-No More. inexpensive and the company provides a guarantee of 100% money back. So, you can check the website at: http://wp.me/p4kgnN-cY and watch the video and read the reviews. 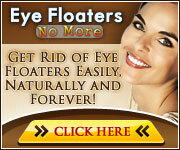 Or, you can visit again my blog and find the new article that I posted as “Eye Floaters Solution”. Anyway, both eye floaters programs are great, and you can choose which one fit better.. I wish you the best for your eye floaters, and thank you again for visiting my site.